Improving an organization’s maturity level is important to deliver more Business value at less cost and more speed. NetYCE has the methods and solutions to help companies achieve what they need. Irrespective of the current level maturity, the netYCE framework can be used to achieve your desired business value. Each network is different and there are many different use-cases. Depending on your desired use-case for automation, netYCE can be used to achieve your desired business benefits. From only using the 'Operate' tools to automate backup configurations or centralize operational changes to full top-down and design-driven control over your networks. Or use the 'Build' and 'Design' tools in the netYCE framework for specific implementation requirements. We know how to get you from A to B (and Z). Just reach out to use (via mail at info@netyce.com) or leave your question here and we can set up a conference call to advise you on all the possibilities. 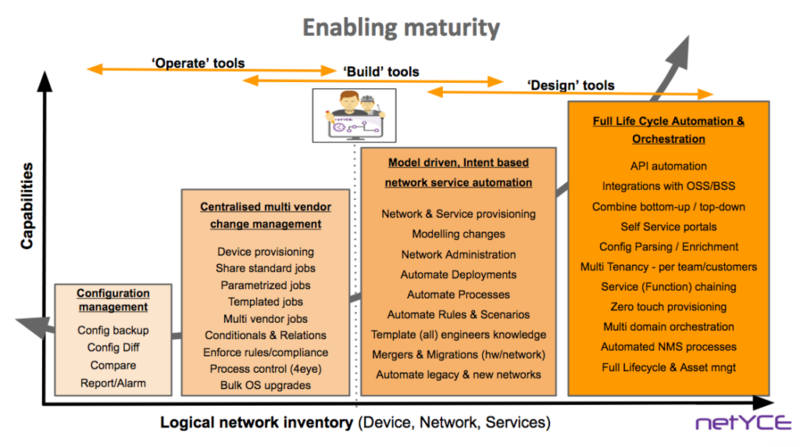 Gartner has defined the following maturity levels with characteristics for each level. In all stages Design Driven Networking can be used help implement the desired processes and objectives.